InLife is a simple, classic and clean blog & magazine theme. Easy to use and install, it includes custom widgets, post customizations, theme options, carousel slider and social media links. 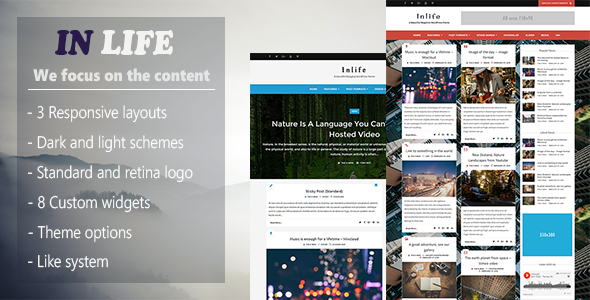 InLife is a responsive theme with 3 layouts and 2 color schemes made for professional bloggers, does not require any coding knowledge or even any previous knowledge with WordPress.